Irish actress, born near Waterford, Ireland, in 1762. Her mother, Grace Phillips, at one time known as Mrs. Frances, was a Dublin actress. Her father, whose name was Bland, was according to one account an army captain, but more probably a stage hand. 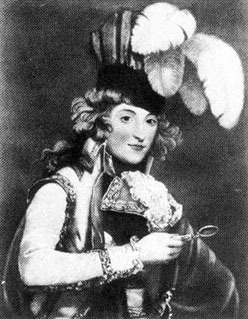 Dorothy Jordan made her first appearance on the stage in 1777 in Dublin as Phoebe in As You Like It. After acting elsewhere in Ireland she appeared in 1782 at Leeds, and subsequently at other Yorkshire towns, in a variety of parts, including Lady Teazle. It was at this time that she began calling herself Mrs. Jordan. In 1785 she made her first London appearance at Drury Lane as Peggy in A Country Girl. Before the end of her first season she had become an established public favorite, her acting in comedy being declared second only to that of Kitty Clive. Her engagement at Drury Lane lasted until 1809, and she played a large variety of parts. But gradually it came to be recognized that her special talent lay in comedy, her Lady Teazle, Rosalind and Imogen being specially liked, and such "breeches" parts as William in Rosina. During the rebuilding of Drury Lane she played at the Haymarket; she transferred her services in 1811 to Covent Garden. Here, in 1814, she made her last appearance on the London stage, and the following year, at Margate, retired altogether. Mrs. Jordan's private life was one of the scandals of the period. She had a daughter by her first manager, in Ireland, and four children by Sir Richard Ford, whose name she bore for some years. In 1790 she became the mistress of the duke of Clarence (afterwards King William IV), and bore him ten children, who were ennobled under the name of Fitz Clarence, the eldest being created Earl of Munster. In 1811 they separated by mutual consent, Mrs. Jordan being granted a liberal allowance. In 1815 she went abroad. According to one story she was in danger of imprisonment for debt. If so, the debt must have been incurred on behalf of others -- probably her relations, who appear to have been continually borrowing from her -- for her own personal debts were very much more than covered by her savings. She is generally understood to have died at St. Cloud, near Paris, on the 3rd of July 1816, but the story that under an assumed name she lived for seven years after that date in England finds some credence.